Specifically for architects, the third title in the Thinkers for Architects series examines the relevance of Luce Irigaray’s work for architecture. Eight thematic chapters explore the bodily, spatio-temporal, political and cultural value of her ideas for making, discussing and experiencing architecture. In particular, each chapter makes accessible Irigaray’s ideas about feminine and masculine spaces with reference to her key texts. Irigaray’s theory of ‘sexed subjects’ is explained in order to show how sexuality informs the different ways in which men and women construct and inhabit architecture. In addition, her ideas about architectural forms of organization between people, exterior and interior spaces, touch and vision, philosophy and psychoanalysis are explored. The book also suggests ways in which these strategies can enable architectural designers and theorists to create ethical architectures for the user and his or her physical and psychological needs. 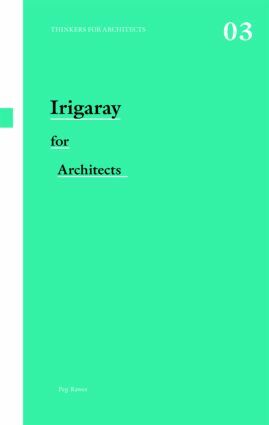 Concisely written, this book introduces Irigaray’s work to practitioners, academics, undergraduate and postgraduate students in architectural design and architectural history and theory, helping them to understand the value of cross- and inter-disciplinary modes of architectural practice.